"The ethical issues connected with Bluebeard's wife-disobedience, betrayal of trust, intrusiveness-have repeatedly preoccupied critics, who associate her disruptive behavior with the transgressive acts of Pandora, Eve, Psyche, and all those other mythical, biblical, and folkloric women who seem to be too curious for their own good or for the good of the human race." (Maria Tatar, "Secrets beyond the Door: The Story of Bluebeard and his Wives." Fairy tale characters such as Psyche, many of the Animal Bridegroom heroines who followed her, and especially Bluebeard's wife, are condemned for their curiosity, which leads them to trouble. Folklorists and critics have noted this connection, as well as connecting them to the myth of Pandora and the biblical character Eve. 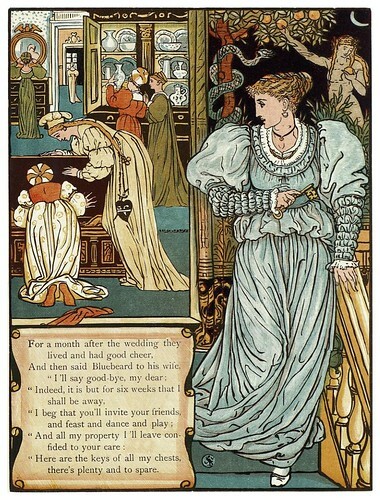 Fairy tale illustrator Walter Crane has solidified this connection by inserting paintings of Eve and the serpent in the backgrounds of his illustrations of Bluebeard's wife (above) and Beauty from Beauty and the Beast (below). Yet this connection bothers me because it's not actually theologically correct. Yes, Eve ate of the fruit of the tree of the knowledge of good and evil, but the main sin wasn't her curiosity-it was disobedience to the one command God gave and the pride of wanting to become like God. Yet more importantly than that for the sake of fairy tales and gender issues, Eve is never held as exclusively responsible for the first sin in the Bible. When she took of the fruit and ate, "she also gave some to her husband who was with her, and he ate" (Genesis 3:6, ESV). This implies that Adam was there the whole time Eve was being tempted, and didn't say anything to contradict the serpent or attempt to dissuade her from eating the fruit. Therefore he was just as responsible as Eve. God sees them as equally responsible when He punishes all three of them-the serpent, Eve, and Adam in Genesis 3:14-19. In fact, later in Scripture, Adam alone is representative of bringing sin into the world-"For as in Adam all die, so also in Christ shall all be made alive," I Corinthians 15:22. However, for years and years the Church itself as well as those outside have seen the Fall as a picture of the sin of women who can't control themselves. The other myths and stories mentioned above have helped cement the idea of heaping the blame on women for global problems. How did this happen? Reminds me of Governor Huckabee's infamous statement that the problem with birth control is that women "cannot control their libido." Yes, it's all women's fault. Men have NOTHING to do with getting women pregnant. 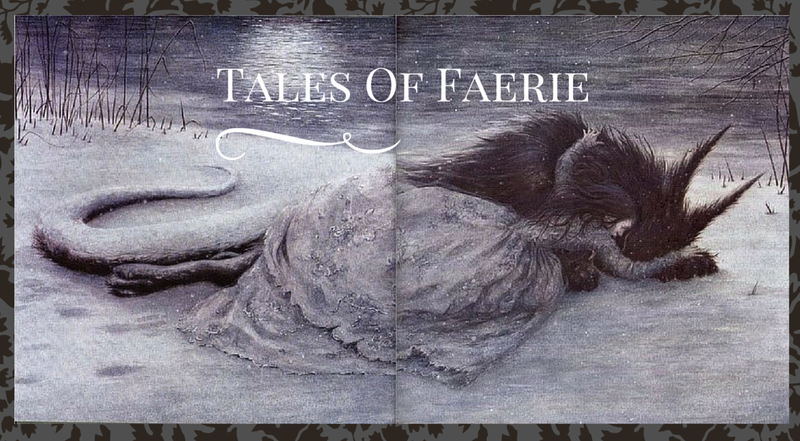 Of course, we shouldn't forget that further back in fairy tale history, lesser known versions of the fairy tales feature women whose curiosity is rewarded-heroines such as in the Grimms' "Fitcher's Bird" find out the murderer's secret, and then heroically rescue and resurrect the other murdered women. Yet these tales are nowhere near as well known, sadly. I remember in my History of Western Civilization class in college we read the Koran's version of the Adam and Eve story which didn't really go into much detail about who was tempted and ate the fruit. I thought that was a nice take. I find using the "Bluebeard" story as a means of condemning women's curiosity very flawed when you consider the fact that old Bluebeard was essentially a SERIAL MURDERER! Without the wife's curiosity, what would the happy ending have been? That she lives happily ever after with a man who had secretly killed all his past lives. Her curiosity essentially revealed him for the killer he was and led to the conflict that would be his undoing. If there's any sin in this story, a little curiosity from the female lead is the least of it! I wasn't aware of the version in the Koran, I'll have to check that out sometime. As someone who enjoys folklore, I not only liked this, but I also appreciate you taking the time to explain the flawed theology behind the Eve-blaming stories. I don't often see theology and folklore together, and I wish I did more.